FRONT and CENTER/ED a Black Artstory | continues…. 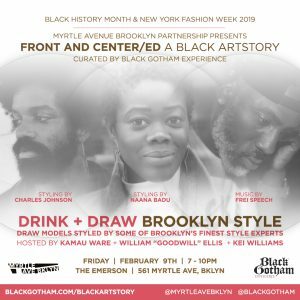 Brooklyn style and fashion bring the history of Black Brooklyn front and center, providing the artistic and historic material to speak on the past, present, and future. Brooklyn style is privileged as art, artifact, and a method to connect with the past today. 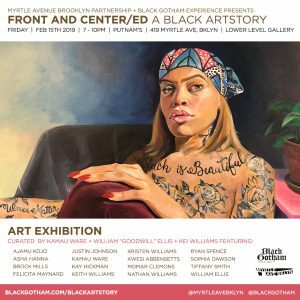 FRONT and CENTER/ED | a group exhibition that takes an historic and whimsical gaze on Black Brooklyn Style. Black Artstory Month on Myrtle Avenue Black Artstory Month is an annual series that celebrates the contributions that African Americans have made and are making within the visual and performing arts world. Every year the Myrtle Avenue Brooklyn Partnership partners with local artists and arts organizations to present the month long celebration, and activate the main street with public art & FREE cultural programming. This year, Myrtle Avenue is working with Black Gotham Experience (BGX) an immersive multimedia project that celebrates the impact of the African Diaspora on New York City with walking tours, a photography-based graphic novel series, and events. 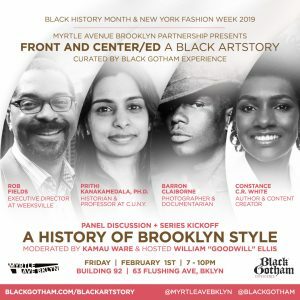 Kamau Ware opens up with a brief presentation on Black Brooklyn history, then moderates two distinguished panels – one on Brooklyn and the other on Style, unpacking the intersections between history with style. Each panel will include a Q & A. Light Refreshments by Wray’s Caribbean Seafood will be available before the panel begins. Models for you to sketch will be styled by Charles Johnson and Naana Badu. Select drawings will be curated live and installed in The Emerson for an exhibition. Music by Frei. Hosted by Kamau Ware, William Ellis, and Kei Williams. Join us for an exhibition that takes an historic and whimsical gaze on Black Brooklyn Style. 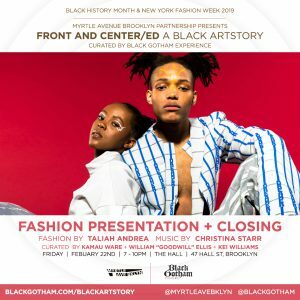 Enjoy the fashion of Taliah Andrea at this special Black Artstory closing event. Music by Christina Star.